Life has a way of putting you on the right path. If things had worked out the way he had initially planned, thoroughbred trainer Alan Goldberg may have just been an enthusiast of the sport, rather than a conditioner with more than 1,100 training wins. The Philadelphia-native attended Drexel University and would occasionally go to the races at Garden State Park in Cherry Hill, N.J. However, life has a way of creating its series of destinations and, upon graduation, where Goldberg attained a degree in business and appeared to be set with his first job, fate would say otherwise, as he didn’t possess the financial means at the time to move to California. 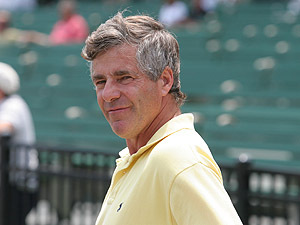 “A friend of mine and I made the decision to stop by Aqueduct and get a job walking horses,” said Goldberg. Goldberg began working for Walter Kelley in 1972 and would stay with the trainer for nearly three years, learning about the business. 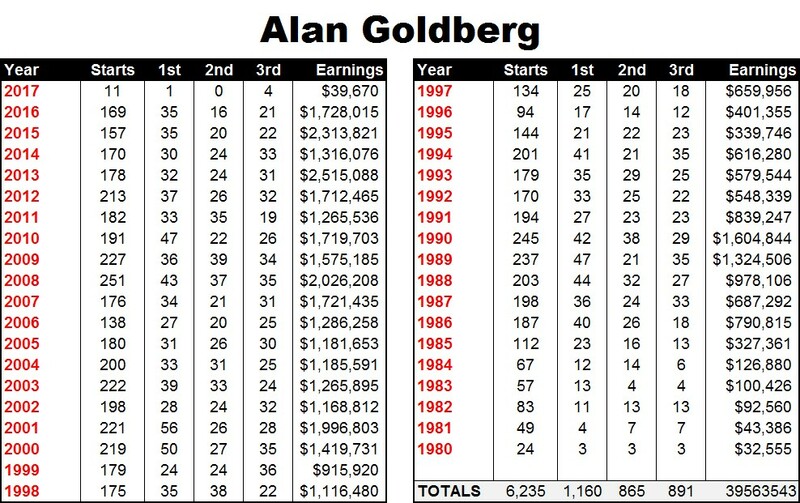 Thoroughbred racing wasn’t a remote consideration as a career choice for Goldberg until he made the decision to go to New York. His passion for the sport continued to develop and evolve. Goldberg also worked for Robert Lake, who trained for Alfred Gwynne Vanderbilt at the time, which allowed him the opportunity to be around a number of nice horses. And a few years later, after his initial exposure with Kelley and Lake, Goldberg would go out on his own, winning his first race in 1974 at Keystone Park (now Parx Racing) with Algernon. It was soon after that he partnered with an owner who would go onto carve out his own successful niche within the thoroughbred industry — Barry Weisbord. However, savvy investments, including seasons for three years in eventual leading stallion Halo, proved profitable. The depth in his barn began to increase gradually. “We had a few horses to train and that kind of got us rolling,” said Goldberg. Those early years provided Goldberg with invaluable experience, and would lead to additional opportunities, with new owners, one being Betty G. Marcus. It was during this time, while his wife was working in New York City, that The Meadowlands opened its doors. He would spend his time at Monmouth during the summer, struggling to make ends meet. However, the years of hard work and adversity would eventually pay off, and the mid-1980s saw Goldberg train a number of stakes winners, with the Mexican-bred mare Mazatleca providing Goldberg with a consistent performer, laying the foundation that it took more than a decade to build. The daughter of Ramahorn was bred by Ignacio Borquez Zazueta, and was owned by Marcus. A versatile performer, Mazatleca had the mindset and demeanor of a professional, said Goldberg. Mazatleca would go onto distinguish herself as a broodmare, producing multiple graded stakes winner and track record setter Mazel Trick. A winner of six stakes, Mazatleca gave Goldberg his first graded stakes winner when she captured the Red Bank Stakes (GIII) at Monmouth Park on June 21, 1986. “She turned out to be a pretty good turf horse,” said Goldberg. Other stakes winners would follow: Tops in Taps, Icy Stare and Tri for Size. But it would be two other fillies that would help prepare Goldberg for what was yet to come — five-time stakes winner Top Socialite and Just Class, a four-time stakes winner (all at different racetracks) with three graded stakes victories. The previous wins, although significant and satisfying, would portend the future. The year 1989 is one that will always resonate with Goldberg. If there was any question as to whether he had made the right career decision; if the hours, days and years were worth the effort; if the sacrifices he and his family made along the way were in their best interests, the answer came in the shape of a once-in-a-lifetime horse. A bay daughter of Horatius would score eight stakes victories in 1989, giving Goldberg his first Grade One and Grade Two Stakes victories, the Test (GI) at Saratoga and the Genuine Risk (GII) and Prioress (GII) at Belmont Park. Safely Kept was arguably the best sprinter of her generation and her 3-year-old campaign earned her an Eclipse Award as the nation’s top sprinter. Bred in Maryland by Mr. and Mrs. David Hayden, and campaigned by Weisbord and later Weisbord and Jayeff B Stable, Safely Kept was a model of consistency that very few horses have approached as a 3-, 4- and 5-year-old. At age four, in addition to her seven added-money wins, five were in graded stakes company — including her electrifying victory in the Grade I Breeders’ Cup Sprint at Belmont Park, the race that saw runner-up Dayjur jump his shadow in deep stretch, and her authoritative performance in the Grade II Genuine Risk Stakes at Belmont Park. She had initially been owned by Dark Hollow Farm and conditioned by Carlos Garcia. Barry Weisbord acquired Safely Kept and raced her during her sophomore campaign, before Jayeff B Stable bought into the filly right before the 1989 Breeders’ Cup Sprint. She would win 13 of her next 17 starts, including five stakes wins during her 5-year-old campaign. Safely Kept would go on to earn induction into the National Museum of Racing Hall of Fame in 2011. By Horatius, and out of the Winning Hit broodmare Safely Home, the dark bay filly would win 24 races in 31 lifetime starts, finishing second twice and third three times, while bankrolling an impressive $2,194,206. However, the relationship between horse and trainer was one that was beneficial to all those involved. In the mid-1990s he would enjoy success with a precocious son of Forty Niner. A stallion prospect in the making, Jayeff B Stables’ Jules would win the Grade III Nashua Stakes at Aqueduct on Nov. 11, 1996, during his juvenile campaign, quite a remarkable feat when one realizes, conformation-wise, he didn’t look the part of a graded stakes winner. The bay colt was sent to the Robert F. Scanlon Training Center in Williston, Fla. and had been entered in a 2-year-olds-in-training sale, but a trip to Florida by Goldberg proved to be a wise decision. The promise was there from the beginning and Goldberg recognized Jules’ precocity. Jules would capture the Long Branch Stakes at Monmouth Park during his sophomore year. “He had some shins or something and we got him started a little late,” said Goldberg. Like many athletes, he had his limitations, but excelled when pointed toward races that suited his running style. Florida-bred Pocho’s Dream Girl, a filly bred by Farnsworth Farm, would win four stakes at four different tracks in the Mid-Atlantic for Goldberg, capturing added-money contests at Monmouth, Delaware Park, Laurel and Pimlico. The filly by Fortunate Prospect, out of the Gallant Romeo broodmare True to Romeo, would go onto earn more than $336,000. Sazarac Jazz went postward 29 times, winning three stakes, and was another of the consistent runners for Goldberg during the late 1990s. She won the Our Mims Stakes during her sophomore campaign and the Open Fire Stakes and the Doylestown Handicap as a 4-year-old. “She was a big good-looking filly, fast and good at going two turns,” said Goldberg. A horse named after a New Jersey township, would go onto win multiple graded stakes, the Grade II Jamaica Handicap and the Kent Breeders’ Cup Stakes (GIII). Bred in Virginia by Joe Albritton’s Lazy Lane Farm, Navesink would run in the 2001 Breeders’ Cup Mile, but wasn’t the most professional in his training habits. The son of Irish River (FR), who raced in the colors of Jayeff B Stables, once “flipped in the paddock, hurt his back, just being an idiot,” Goldberg said. The chestnut gelding raced for seven years, retiring with earnings of more than $475,000. A son of Woodman bred by Calumet Farm had Goldberg thinking about the Classics. Runspastum, owned by Jayeff B Stables, would go postward 40 times, race six years and earn $562,725. A multiple stakes winner, Runspastum’s added money wins included the Frederico Tesio Stakes during his sophomore campaign and the Grade III Oceanport Handicap at Monmouth Park as a 4-year-old. The following years would yield optimal results with runners scoring in stakes’ company. Graded stakes winners like Social Queen and Awfully Smart, and additional depth in the barn from added-money winners Contrast, Gilded Gold and Schedule (GB) found the winner’s circle from Goldberg’s barn. However, it was a son of Smart Strike, out of the Dixieland Band mare Shag that would place the racing world on notice. Jayeff B Stable’s chestnut colt Strike a Deal, would win or place in 12 stakes, with wins in the Laurel Futurity, the Red Smith Handicap (GIIT) and Dixie Stakes (GIIT). Strike a Deal would retire with earnings of $1,071,675. And much like Jules, Goldberg saw potential in Strike a Deal as a stallion prospect, but fate has a way of allowing life to make unforeseen adjustments. The following years would find multiple graded stakes winner Straight Story and added-money winner Check Point emerge from Goldberg’s barn, however, two Irish-bred fillies, both who would go onto win Grade I races and the Robert Masterson owned, Kentucky-bred bay daughter of Empire Maker, Grade II winner Nefertini, would follow suit in outstanding company. However, it was the ill-fated elite turf mare Laughing as well as Tannery that brought the Grade I spotlight back to Goldberg’s barn. Richard Santulli’s Laughing won the Taylor Made Matchmaker Stakes (GIII) at Monmouth in 2012, adding to her impressive resume with graded stakes scores during her 5-year-old campaign in 2013, the Grade One Diana Handicap at Saratoga, the Flower Bowl Handicap (GIT) at Belmont Park, Grade II Ketel One Ballston Spa Stakes at Saratoga and the Eatontown Handicap (GIIIT) at Monmouth Park. The 2013 Eclipse Award finalist for outstanding female turf performer would succumb to colic in January 2014. Laughing was by Dansili, out of the Be My Chief broodmare Comic, and earned $1,178,855. Tannery was the other Irish-bred that won at the highest level, capturing the E.P. Taylor Stakes at Woodbine (GI) in 2013. The daughter of Dylan Thomas, like Laughing, was campaigned by Santulli, and had won the Sheepshead Bay (GII) earlier in the year. The mare would go onto capture the Miss Liberty Stakes at Monmouth Park as a 5-year-old. Force the Pass winning the Belmont Derby. A son of the 2004 Eclipse Award winning sprinter Speightstown, Richard Santulli’s homebred Force the Pass, who was out of the owner’s multiple graded stakes winner Social Queen, would allow his connections to return to the winner’s circle as a Grade I victor. Force The Pass won the 2015 Belmont Derby Invitational. Force the Pass, 2016 Preakness participant and three-time stakes winner Awesome Speed, and stakes winners Take Cover and Name Changer are part of a deep barn Goldberg brings into 2017. “I’m kind of excited about it,” said Goldberg. A presence on the NYRA, Parx and Maryland Jockey Club circuits, Goldberg plans to run at a number of different tracks this year. He has a quite a few horses being broken and trained at Roy Lerman’s Lambholm South in Reddick, Fla.
And although Goldberg runs a number of horses in the winter at Gulfstream Park, he can most often be found at Santulli’s training facility in Colts Neck, N.J.